27th June 2017, Dubai, U.A.E. 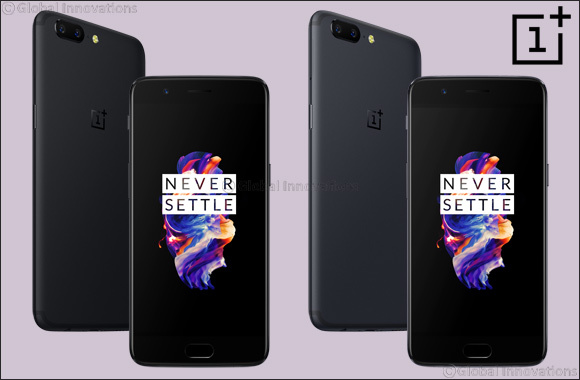 : SOUQ.com has announced the pre-order of the OnePlus 5, the much-anticipated flagship smartphone from global mobile technology company OnePlus. The impressive device features a 16MP and 20MP dual camera - the highest resolution dual-camera system on a smartphone today. The OnePlus 5 captures the best quality photos with professional and powerful effects. The OnePlus 5 is available in limited stock for pre-order on SOUQ.com in the UAE starting at 1799 AED for 6GB version. The industry-leading Qualcomm® Snapdragon™ 835 processor powers the OnePlus 5 through demanding apps and games, making it incredibly power efficient. Available in a configuration of 6GB RAM and 64GB storage or 8GB RAM and 128GB storage, the OnePlus 5 is an exceptionally fast Android smartphone. Built out of anodised aluminum and boasting a slim body with stamina at just 7.25mm, the OnePlus 5 embodies the visual identity and strong performance features of a high-end flagship smartphone. Its Dash Charge rapid-charging technology provides a day’s power in half an hour of charging, while OxygenOS gives users a refined version of stock Android. With the highest resolution dual-camera system available on a smartphone and the intelligent Smart Capture software, the OnePlus 5 automatically optimizes photos for accuracy and clarity. The OnePlus 5 also features a new Reading Mode that provides the flexibility of a smartphone with the comfort of an e-reader. By using an ambient sensor to gauge environmental lighting conditions, Reading Mode optimizes the display for reading through gray-scale mapping and filtering of blue light.